30 pieces of high power LED beads are well built with premium material, offer 30000 Hours service time. It is 2 times than other solar light. World-leading Solar Light Brand-As the leader of the solar light industry, LITOM focuses on the innovation of design and technology to provide the best lighting experience to customer from all over the world. LITOM has sold more than 5,000,000 solar lights outdoor and been favorably reviewed by more than 4,000,000 customers. Super Bright Lighting Experience-Combining 30 pieces of high power LED beads with the innovative wide angle design, LITOM Outdoor Solar Lights improve the light utilization by 30% and lighting angle 50%. The illumination range of one motion sensor light can reach 215 square feet and 860 square feet for 4 solar lights to be used simultaneously. All-Day Working Light-Adopts world-leading solar panel that produced by SunPower, which photoelectric conversion rate is 25% higher than other solar panel. 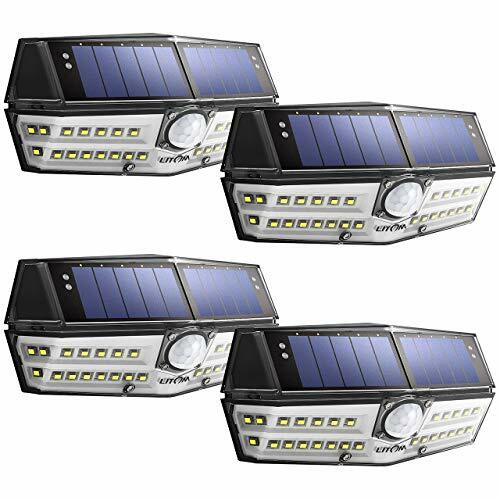 LITOM solar motion lights outdoor absorb and convert sunlight into electricity and stores in daytime and light up for 30 seconds when motion detected at night. It will prolong lighting time if motion detected once again during lighting, which meets your need to for all night use. Best-in-Class Sensor-LITOM develops its own PIR sensor on this solar motion sensor lights which sensing range and sensitivity are both 20% higher than general solar lights, bringing ultimate using experience. 36-Month-Long Life Span-LITOM Security solar light outdoor is the first solar light rates IP67 in the world that it completely protects circuit and battery and makes its life span 3 times than other solar light. If you have any questions about this product by Litom, contact us by completing and submitting the form below. If you are looking for a specif part number, please include it with your message.